On Day 52 (25th March), not much change was visible, but upon closer inspection, it was clear that a lot of tedious work had been completed. 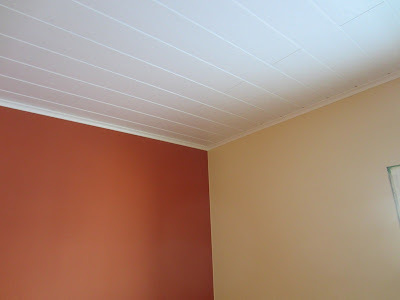 The day went into installing strips of wood all around the edge of the ceilings in order to cover the top edge of the plaster board and the gap between that and the panelling of the ceiling. This is brilliant, because the use of this material also means that painting can be done a lot quicker since the corner does not need so much care. 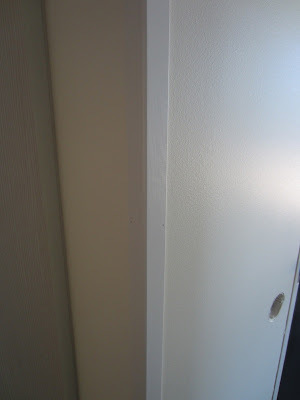 Where two plaster boards meet in a corner usually only a little plaster is needed to smoothen things up if it's an "inside" corner, like the corner of a room, where the walls have a right angle (90°) between them. However, wherever the corner is sticking out, i.e. where one faces the corner edge-on like in the photo above, it's near to impossible to smoothen the rough edge of the plaster board to an acceptable degree using plaster alone. Therefore also here, two strips of wood covering the corner make things look neat and tidy. Only one such corner was done today, and I guess the rest will come tomorrow. Also the door frames still need strips of wood covering the gaps between them and the adjacent plaster board. If the weather forecast for tomorrow holds, and it is not too cold in the afternoon, big things are going to happen: we are planning on opening the roof again and building the chimney up to its final height. Keep fingers crossed, there'll be an interesting update tomorrow.